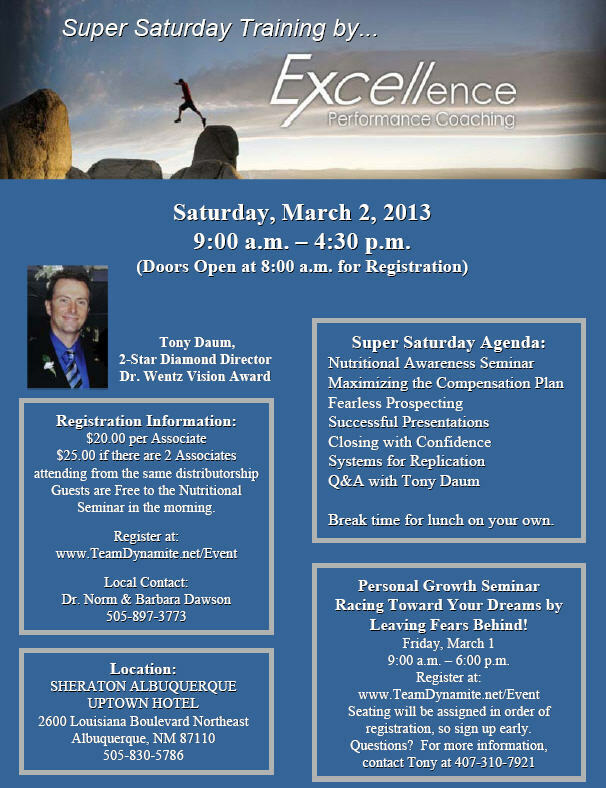 USANA Vision Tour is coming to Albuquerque!! USANA is coming to Albuquerque!! USANA is sending 2-Star Diamond Tony Daum to Albuquerque as part of the USANA VISION TOUR. The Vision Tour event will be from 7:00 to 9:00 pm on March 1, at the Sheraton Uptown. This event is FREE for associates, preferred customers and guests! Invite your friends and family. Let’s pack the room at the Sheraton Uptown on Louisiana and Menaul and show USANA that we are ready to rock New Mexico! As an added bonus, Tony Daum will also be doing a couple of other great seminars on March 1st and 2nd at the Sheraton Uptown. On March 1st from 9:00 am to 6:00 pm Tony will be doing a personal development coaching event entitled: Racing Towards Your Dreams by Leaving Fears Behind. This event open to everyone. USANA associates and the general public. Pricing is $99.95 per person. The 1st part of the day is a Nutritional Awareness Seminar followed by training on how to help your USANA business explode! Cost is $20.00 per USANA Associate and FREE for Guests. Register now for both events http://www.teamdynamite.net/event. When you arrive come and find us to say hello! USANA Vision Tour Hits San Diego – See & Hear Tony Daum! USANA Vision Tour Hits San Diego! For all our friends and family that are in or near San Diego. Please take advantage of an incredible opportunity to see and hear Tony Daum speak. He is not only one of our mentors and part of the USANA Vision Tour, he is an amazing trainer and speaker. After you watch him speak, please go up and tell him Richard and Patty Burns invited you to attend. Please let us know if you have any questions and tell us what you liked best about what Tony had to say.